Although I'm not the largest fan of legal thrillers, Phillip Margolin has always managed to grab my attention. I became hooked when I read Sleeping Beauty (2004) which, despite the various negative reviews I've read on it, was actually very, very suspenseful and unpredictable. 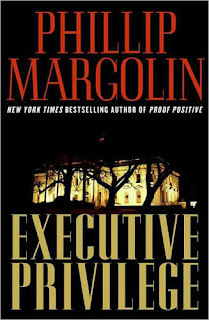 Executive Privilege features scandal in the White House; in which young girls turn up dead after having "relations" with the President of the United States. When tough-girl, private investigator Dana Cutler witnesses a secret meeting between the president and a young woman, she must flee to save her life when she learns the girl has been murdered. Meanwhile, a goody-two-shoes, junior lawyer associate named Brad Miller makes a discovery that suggests the president and his men have framed a killer on Death Row for the murder of another young girl secretly involved with the president. Obviously, something fishy is going on and it's only a matter of time before the president's secret is exposed...unless Dana and Brad become fish-food themselves. Phillip Margolin has a knack for creating characters you can't help but like. While the mystery portion is easy to solve, you can't help but appreciate and enjoy the fast-paced plot. 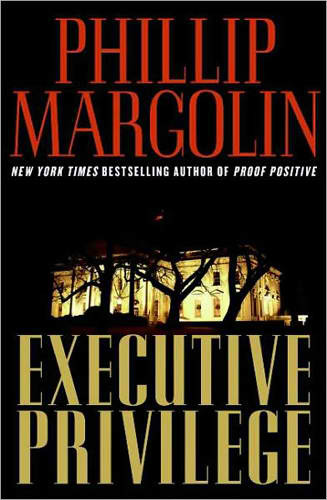 Executive Privilege is the perfect blend of action and suspense and definitely satisfies if you're looking for an escape. In addition to Sleeping Beauty , other Phillip Margolin books I highly recommend are The Associate (2001) which I also reviewed here: Dreamworld Book Reviews -- The Associate and Gone, But Not Forgotten (1993) reviewed here: Dreamworld Book Reviews -- Gone, But Not Forgotten.